I love lush & their products, the scents & the range of products are gorgeous. I am always on the look out for recommendations so please tell me your lush faves! The product im reviewing is 'The comforter' bubble bar. I absolutely loved this product! The bar is huge & can be broken into pieces and reused for lots of baths. Although the bar is huge, i used it all at once and it turned the water a gorgeous pink colour with lots & lots of bubbles. The smell is gorgeous,as most lush products are! It had a really nice, fruit scent that wasnt overpowering & lingered in the water for a long time which i liked. I think this is really good value for money at just under £4 & i would say can be broken up into 4 pieces, so perfect for 4 pink, bubbly baths. 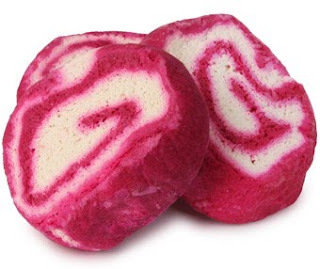 I also love the swirly, pink & white pattern of this bubble bar. This wasnt drying to my skin at all, however i found that it felt slightly greasy in the water, but this was the only downfall i found with this product & maybe this was because i used the whole bar! It left me feeling moisturised afterwards & not greasy at all. Overall i love this product, and would recommend to all. Lush do a wide range of bubble bars, and this plus the creamy candy bar are defo 2 of my faves! Would i buy it again: I will definately be purchasing again (but maybe not using the whole bar at once next time!) I found this extremely soothing, and was nice after a long day. I LOVE this bubble bar! Excellent review! I think I actually want to eat the bubble bar judging from the pic though? Probs not a good idea..
Ugg Boots! & A Discount Code! My Top 5 Barry M Nail Paints! To Depot Or Not To Depot? Oh Dear...Guess Whose Been Shopping At MAC Again? MAC, NARS, YSL & CCO Haul!